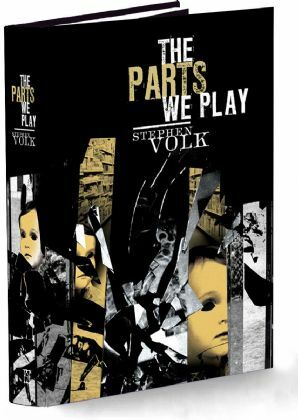 Across stories stitched together from video footage, distorted and trashy newspaper articles and a magician’s illusionism, Stephen Volk has presented us with a new monster in the moment of its transformation from analog to digital. Taken on their own, these are all admirable and gripping tales; each one differently twisty, moving, fantastic or incisive. More importantly, they stretch a theme and vision across the varied narratives, developing as they span the slippery changes within and through their horrors. From the Michael Jackson surgical mash-up, the hyperactive manikin, the woman who hides someone away and finds ‘The News’ already there, the vampire that comes when you keep quiet about something you shouldn’t, the folk tale that can visit its collector (“Our stories are ourselves”), plain old phantoms, irrational concealment of information from an unrealistically vulnerable public, to, perhaps most impressively, a Derren Brown-like set piece that turns on itself, these are tales about how representations are not flimsy unrealities, but have an agency and mass of their own. How, in an age of fictional information, our “parts” are not necessarily something we have control of, but may have control over us. Probably like many people, my first encounter with Stephen Volk’s work was through his monstrously misunderstood TV play ‘Ghostwatch’; only tangentially concerned with ghosts or the supernatural, Volk’s drama remains one of the few moments when the endlessly reflexive medium of television was fully turned against itself. But in turn, it turned against Volk, and he found Great Manipulators accusing him of manipulation of a defenceless public. In The Parts We Play, Volk, in numerous ‘voices’ attends to this mysterious Ouroboros quality in mass media, incrementally speeded now; at least one spectator from the sidelines is drawn too intimately into the illusion and finds out what a dark coffin an ‘insider’ is. Volk gets within individual myth-making; the revelatory self-justification of a child murderer, the subjective experience of a media-monster, the horror of a folk-horror expert when expertise itself becomes haunted. Taken on their own these stories are gripping and impactful – and there is a tremendous range of voice, from genre fiction, through a nostalgic Wells-like yarn with a fabulous twist, to simple and naturalistic empathic writing – but together they constitute an attempt to triangulate a Spectacle that has no form and every form, to trap a post-truth truth about how authenticity is equally valorised in pure and fabricated forms, about how an increasingly digitised culture, for which there are no longer any authoritative texts, is eating itself and parts of us.